A common complaint by motor vehicles drivers is that “bicyclists always run red lights.” Bicyclists do so for a reason very obvious to bicyclists but missed by motor vehicle drivers – for a bicyclist, most lights are red. If the signals are set for 25 mph, and the bicyclist is riding 15 mph, the bicyclist won’t make more that two green lights before hitting a red again, and sometimes it is every signal red. How would motor vehicle drivers react if every light was red? They’d probably look to see if there was any conflicting traffic, and then run the red light. A few drivers already do this, but unfortunately the perception skills of these drivers seems to be low, and they often misjudge whether there is conflicting traffic. Bicyclists do the same thing, but perception skills seem to be much higher with bicyclists. Maybe because there are more serious consequences for misjudgment. Close to home, the best example of a bicycle green wave is Valencia Street in San Francisco. The bicycle green wave speed of 13 mph calms traffic and makes it an enjoyable ride for bicyclists. Valencia is a two-way street that has also been calmed with a reduction in travel lanes and the addition of bike lanes. A pilot green wave has been installed on 14th Street, a one-way street that has been partially calmed. Farther afield, there is a famous green wave on Copenhagen’s Nørrebrogade, the busiest bicycle street in the Western world. 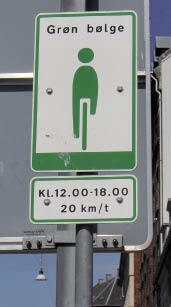 Many other cities have implemented or are considering bicycle green waves. Great video on Copenhagendize. How about Sacramento? I’d like to see at least two east-west and two north-streets set to a bicycle speed green wave, as a pilot to see how it works here. Since the grid area of Sacramento is so flat, a speed of 15 mph might be possible, though the common European speed of 20 kph, 12 mph, is a good starting point. The grid block size in Sacramento is different from that of San Francisco, and pedestrian crossing times have to be included in the calculation, so the resulting speed might be different. I’m sure it is possible to calculate optimal speeds for one cardinal direction or two cardinal directions, and various grid sizes, but to be honest, this is beyond my math abilities at the moment. I’d propose the J Street & I Street couplet as the first location. Why pick what is perhaps the busiest street in Sacramento, J? Because it has so much business along it that would benefit from traffic calming. J is packed, some times of day, with motor vehicles going somewhere else. If it were instead packed with motor vehicles and bicycles going along slowly enough to notice and patronize the businesses, we’d all be better off. The reasons for the reinvigoration of Valencia Street in San Francisco are many, but the green wave has certainly contributed. The conversion of parts of J Street from three lanes to two lanes with bicycle lanes has been proposed by the City of Sacramento, but so far as I know, has not yet been funded. A green wave could be the first step for calming J Street, and it costs nothing except some staff time to change the signal timing. I am not unaware that many commuters will hate this idea. William Burg coined, or at least used, the expression NIMC, not on my commute, referring to suburban commuters who will be opposed to anything that slows their commute into and out of downtown where they work but don’t live. So what! Livability should be the right of everyone who lives in of downtown and midtown, and the suburban commuter should have no say. They are the ones that have chosen to work one place and live another, and I have no sympathy. I’m tired of having the quality of my life stifled for the benefit of commuters. So how about it – a bicycle green wave for Sacramento! First, some pilot streets, eventually, all streets. Note: I am not generally in favor of either stop signs or traffic signals. I believe that we have far too many of them. I am certainly not suggesting that there be more traffic signals in order to create a bicycle green wave, just that the signals which exist should be used to create a bicycle green wave rather than a motor vehicle green wave. I would HATE if J st. was only 12mph. Maybe I st, but not J,K,12th, and 16th. Those are the fastest streets in downtown. I will purposely get off Hw 50 and get on I-5 just so I can take the J st exit even if I add an extra mile or two to my trip. It’s still faster than having to go through stop signs. If it were only 12mph, it wouldn’t be much of an improvement on hitting stop signs, and that would be beyond frustrating. Bicyclist are almost exclusively downtown residents. Creating green wave roads to make them bike friendly won’t change the amount of riders by much, and that’s the ultimate point of doing it. Evidence from other locales that have implemented the green wave have seen great increases in bicycle traffic. We have streets like that more often than not. (In other words, most streets in the USA do not have synchronized or sequenced traffic lights). And most motorists do not run these red lights. In downtown/midtown Sacramento, the lights are indeed synchronized for motor vehicle speed at the 25 mph speed limit. Actually, the timing is set slightly above that, motor vehicles going the speed limit can’t quite keep up. In this situation, lights are green for motor vehicles and red for bicyclists. It’s a fact, at least on these streets where I live. And yes, late at night, when there is little traffic, I see motor vehicle drivers stopping or slowing, and then going, at red lights, more than half the time. I bet they used 10-second offsets for 27.9 mph because it made the rest of the system too complicated if they used 11.2-second offsets to get it right on. The math is actually pretty straightforward: your blocks in Sacramento are 410 feet long, so if the lights change every 30 seconds, your green wave will be 410 ft / 30 sec * 3600 (sec/hr) / 5280 (ft/sec) = 9.3 mph. You could get to 11 mph if you went to 25-second signal phases, but if you have any roadways that are wider than 63 feet ((25 sec – 7 sec) * 3.5 ft/sec) that wouldn’t leave enough time for a legal pedestrian crossing. Valencia isn’t really particularly designed for 13 mph—that speed is just what you get when you have ~550 foot blocks with 30-second phases. Thank you for helping me understand the calculations. At least in the downtown/midtown area of Sacramento, there are very few streets over 63 feet.